You are invited to THE best summer party in Ventura! This 31st season is a season of dance! Purchase your tickets early as many of these concerts consistently sell out. 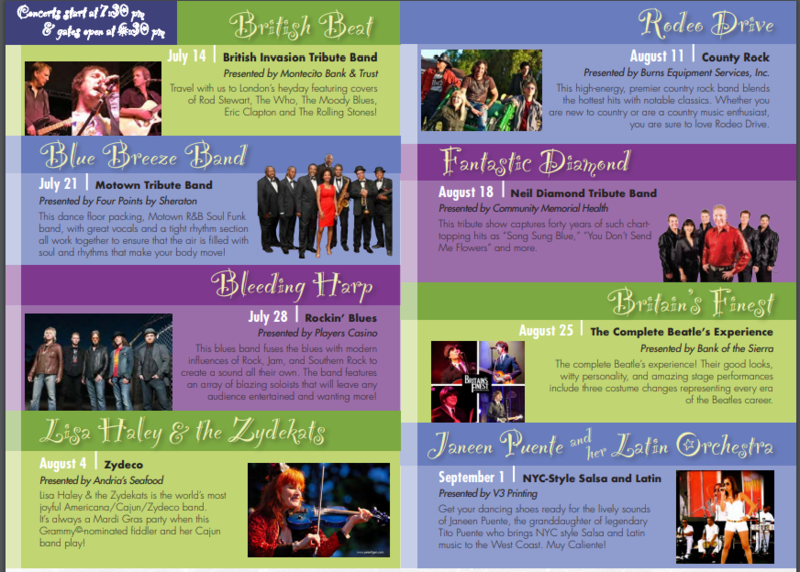 Enjoy the return of popular favorites as they pay tribute to The Beatles, Motown, Zydeco, Rolling Stones and Neil Diamond and experience new bands and their brand of Country, Blues, Salsa, and Rock. The City of Ventura Parks, Recreation & Community Partnerships proudly presents the 31st year of this popular concert series from 7:30- 9:30 pm, outdoors at the historic Olivas Adobe, 4200 Olivas Park Drive, near Ventura Harbor. The venue is intimate, seating is limited, and concerts regularly sell out, so avoid disappointment at the door by making reservations by calling, 805-658-4726 M-F 8 am-5 pm, (closed alternate Fridays). Get ready to dance eight Saturday nights this summer in the courtyard of the historic Olivas Adobe!